Home/Sikh News/Nabha JailBreak | Indian intelligence Services are Silent on Escapee Bhai Kashmir Singh | Parents are Concerned about his life | False Police Encounter. 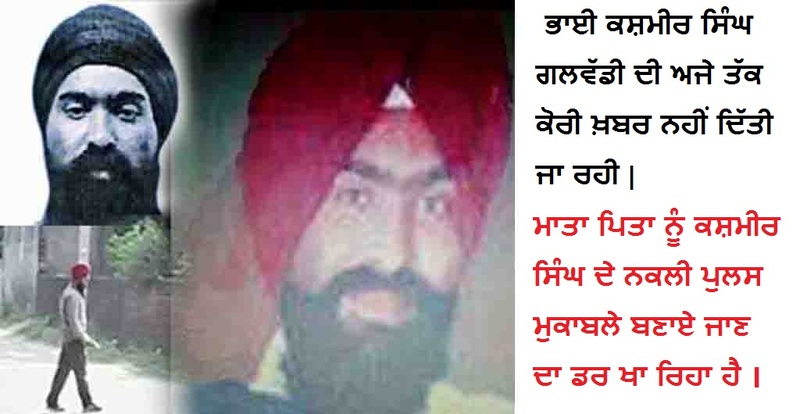 Nabha JailBreak | Indian intelligence Services are Silent on Escapee Bhai Kashmir Singh | Parents are Concerned about his life | False Police Encounter. The Panjab police and the Indian intelligence services are very silent on the matter of jail break escapee Bhai Kashmir Singh . Till today they have not given further information or any news about his whereabouts. Kashmir Singh’s elderly parents-are concerned about his life and especially about false police encounter. Kashmir Singh is the only one of four accused in the attack on Harvinder Soni, general secretary of the Punjab unit of the Shiv Sena, who had not been let off on bail in the attempt to murder case after over one-and-a-half years. He was arrested by Gurdaspur police in April 2015 along with three others. “The attack was a self motivated act of Kashmir Singh and three others. They were not connected to any terror group and had no link with the any gang. But we will again investigate the co-accused with Kashmir Singh if they met him recently,” said Gurdaspur SSP Jasdeep Singh. “Only Kashmir Singh was behind bars in this case and other three persons had already got the bail. Other three were granted bail by the session court in Gurdaspur. Kashmir’s bail was rejected by the High Court due to serious natures of charges against him,” said Jasdeep Singh.